The land upon which Washington High School sits was first acquired for public school use in 1867. At that time, the only schoolhouse on the eastside of the Willamette River was a small shack located at the corner of SE Oak and SE 11th Avenue. When the School District announced they would call a vote to build a new schoolhouse on the same lot, Joseph Buchtel—a notable pioneer who came to Portland in 1852—pushed for the acquisition of a much larger site. Enlisting the support of other progressive voters, there were ultimately enough votes to obligate the School District to purchase two full blocks. The site he pursued was bounded by Stark, Alder, 13th and 14th. It was still “in the timber”—meaning, the land had yet to be cleared of trees—and many questioned why so much property was needed for school purposes. However, Buchtel was forward-thinking and believed that two blocks were necessary to provide for both the school and its grounds. 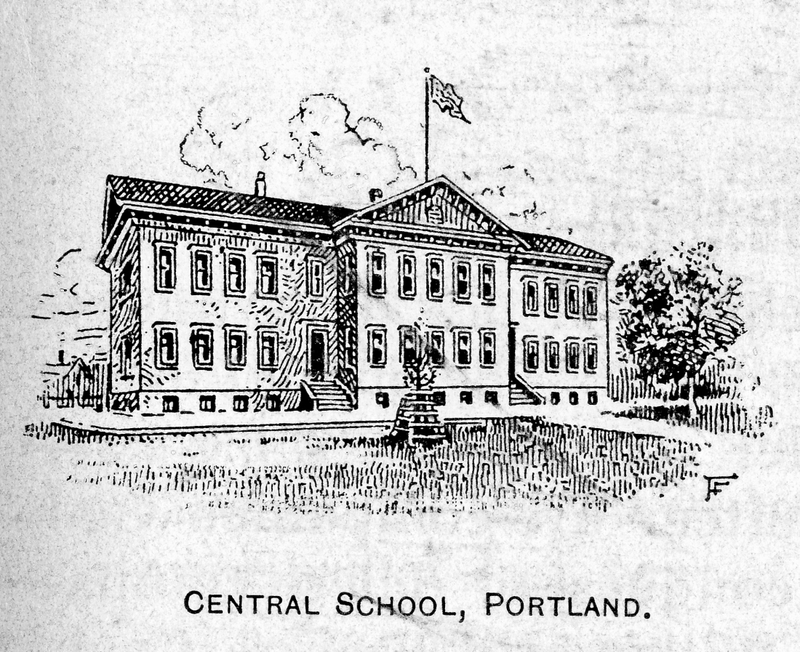 The first school that was built was a wood-frame, Greek Revival-style grade school called “Central School.” Like the current Washington High School, the new schoolhouse took advantage of its sloped site, facing west to downtown and the river. Portland’s eastside was growing rapidly at the end of the 19th Century and the four-room schoolhouse could not keep pace. In 1897, the Hawthorne Grade School was built on the southern portion of the site and the old Central School was demolished. 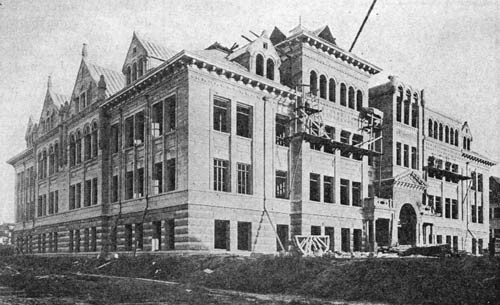 Starting in late 1905, Washington High School—the eastside’s first high school—was under construction on the northern portion of the site. Completed in 1907 and designed in the Richardsonian Romanesque style, the first Washington High School became an instant architectural landmark in Portland. However, as beautiful as it was, critics of the building found fault with its heavy timber and masonry construction, which was not fireproof. This would be a harbinger of things to come, for on the night of October 25, 1922, the high school was set ablaze. After hours of fighting the fire with almost every piece of firefighting equipment in Portland, the building’s roof caved in and all that remained were portions of the blackened walls. Washington High School in ruins in 1922. 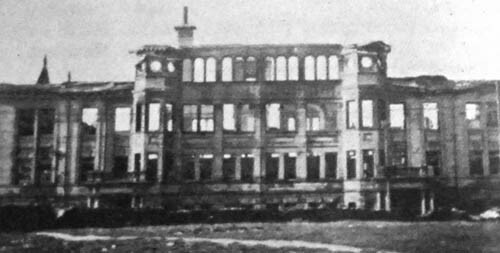 The Washington High School fire was the City’s largest and most expensive in 1922 with damages estimated at nearly $400,000. It also resulted in the death of firefighter Oscar Benjamin Gabriel, who was crushed when trying to outrun a falling gable end wall. Portland’s fire marshal believed the conflagration was the work of an arsonist given that a number of unexplained fires had recently broken out in the city. The arsonist targeted churches, schools, and other large buildings during the evening hours when they were not in use. 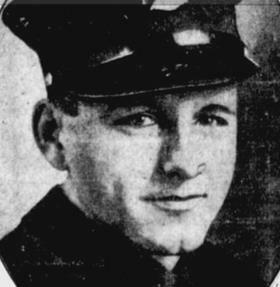 While the case was never officially solved, it was believed the fire was the work of firefighter Chester Buchtel. 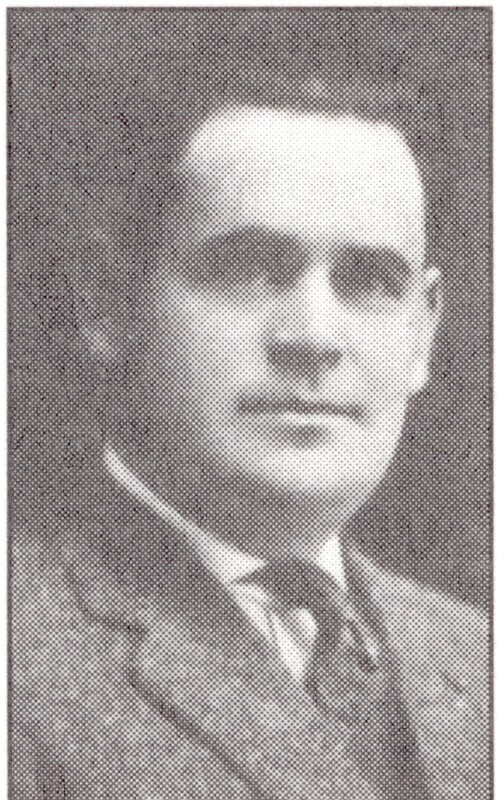 In 1925, he confessed to over a $1,000,000 of building fires in Portland. Ironically, Chester was the grandson of Joseph Buchtel—the pioneer who organized the original purchase of the Washington High School grounds. 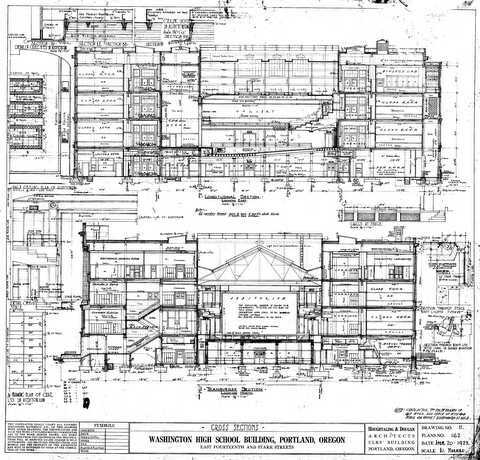 Washington High School was designed by the local architectural firm of Houghtaling & Dougan. Other notable buildings designed by the partnership include the Elks Temple (now the Sentinel Hotel) and the Medical Arts Building—both downtown. 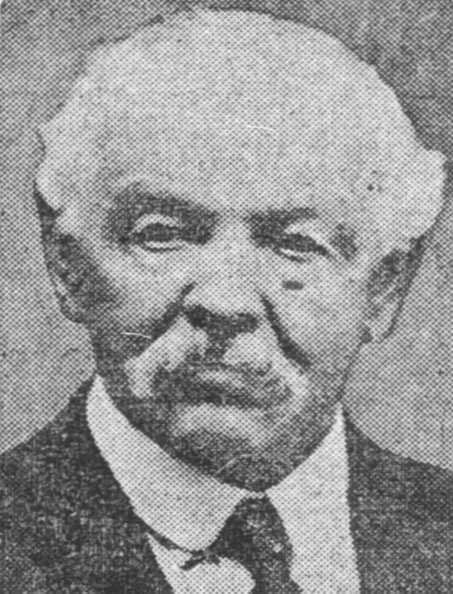 Before the two architects joined forces, Chester Houghtaling was the design engineer for the Burnside and the Ross Island Bridges. While studying in Chicago, Lee Dougan worked for Frank Lloyd Wright and Louis Sullivan. The team was hired to design a replacement building for Washington High School because Portland Public Schools had recently lost their District Architect. 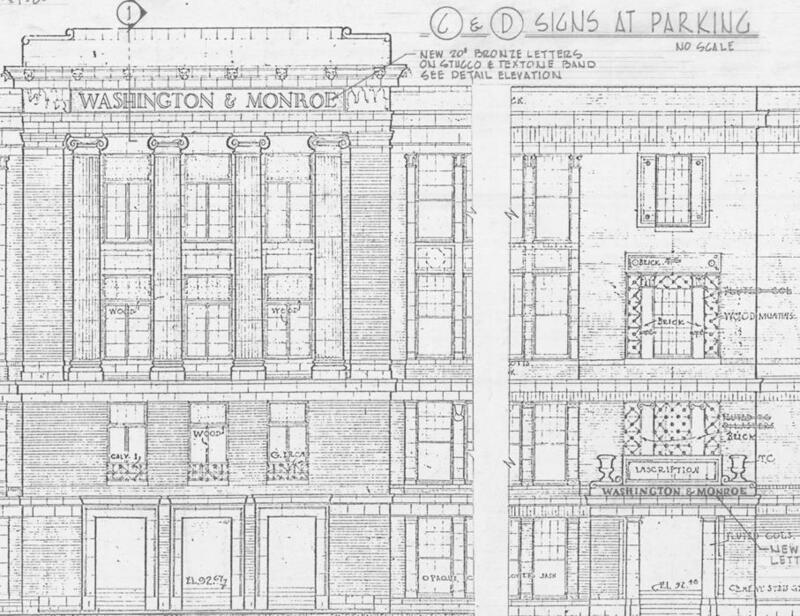 For a short time in the 1920s, they relied on local firms to design their new buildings. The choice of Houghtaling & Dougan was not without controversy, as the architects’ religious affiliation became a hot topic for certain community groups who wanted them fired. However, the School District stood firm in their selection, stating that the architects were hired for their competency in designing buildings and that their contract would stand. The drawings and specifications for the building were fast-tracked and completed in only four months. The architects were constrained by the original high school’s foundation, upon which the replacement school was to be built. Built of poured-in-place concrete, the red brick is a nonstructural veneer. With very little wood in the building, its fireproof construction was considered state-of-the-art for the time. While very similar in size and plan to its predecessor, the exterior was a less ornamented design in the Classical Revival style. This style was considered to be inspirational and a vehicle to further the ideals of democracy and public education. However, the building is not without a unique collection of architectural details, including Ionic and Doric columns, bas relief panels, terracotta friezes, caryatid-head capitals, and inspirational quotes. (Check out this post for an example.) The building design as a whole not only demonstrates the skill and creativity of the architects, but also reflects its purpose and importance as a neighborhood landmark. Facade features caryatid-head capitals, lion heads, and terracotta friezes. 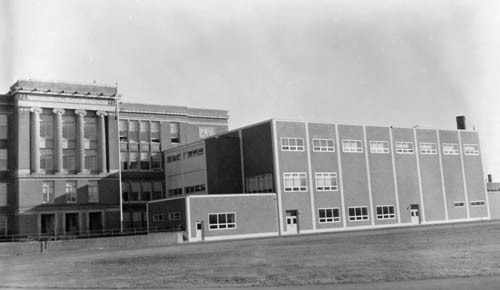 Historically, the Washington High School campus had multiple buildings. The Hawthorne Grade School was a wood-framed building in the southeast corner of the campus, built in phases starting in 1897. In 1910, a gymnasium designed by Ellis Lawrence was constructed to the south of the grade school, aligned with SE 13th Avenue. Between the two buildings was a boiler room and chimney that was built in 1912. 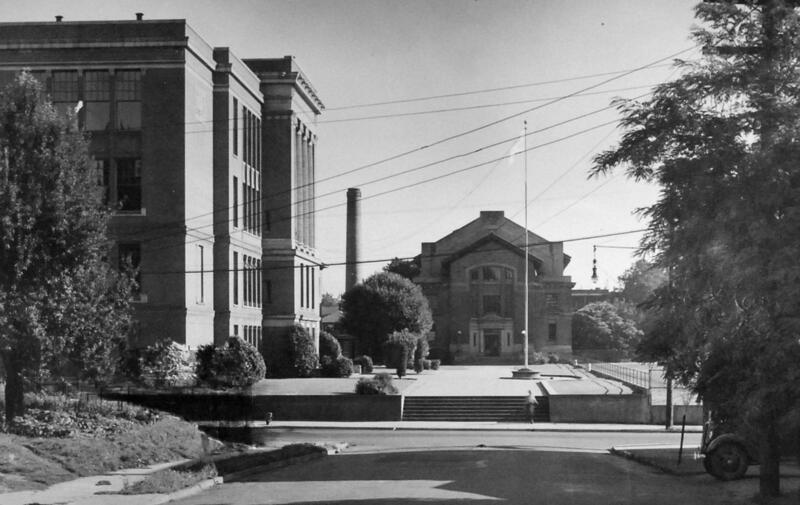 Campus buildings including the Lawrence Gym in the 1930s. In 1930, the campus doubled in size after the School District finally assembled the two blocks to the west at a cost of $52,200 for the long-awaited creation of an athletic field. Previously, these blocks contained houses and apartment buildings which were moved to new locations. 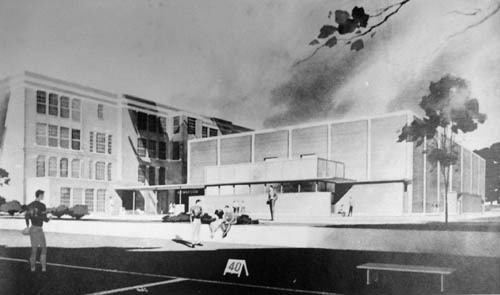 Relatively untouched for years, the Washington High School campus saw its first major change with the addition of a new International Style gymnasium in 1958 on the south side of campus. This addition resulted in the demolition of the Hawthorne School, followed by the removal of the Lawrence gymnasium two years later in 1960. 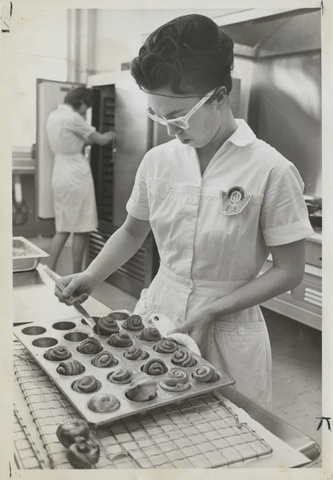 The final phase of the 1958-1960 campus changes was the building of a new cafeteria, music, and classroom wing. The “C Wing” was connected on the front façade of the high school, leaving a large scar after its demolition in 2006. This coincided with the sale of most of the four-block site—except for the high school—to the City of Portland’s Parks & Recreation Department. Prompted by a decade of low high school enrollment throughout the city, Portland Public Schools started to take steps to consolidate their existing schools in the late 1970s. One school considered for consolidation was Monroe High School, which would ultimately merge with Washington. Monroe High School was the smallest high school in the city with only 470 students in 1977. This all-girls polytechnic school specialized in job-preparatory classes in dental assistance, food service, secretarial science, nursing, and business distributorship. It was also unique in that it drew its student body from the greater Portland area—not just the immediate neighborhood. Washington High School also feeling the effects of a declining student enrollment at this time. It went from 1,504 students in 1969 to 772 in 1977. This loss of students made the high school vulnerable to closure, which was first proposed in 1975. However, after citizen and local government objection, Washington High School remained open for the time being. Given this alignment of circumstances, it was determined that Washington and Monroe become one. 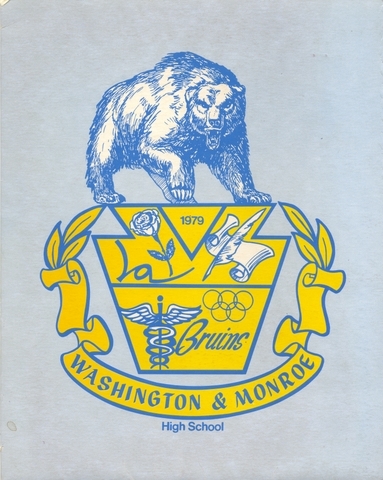 In the fall of 1978 the two schools merged at the Washington High School campus and became known as Washington-Monroe High School or “WAMO.” Façade changes were planned for the building and the school officially changed its mascot from the Colonials to the Bruins. However, after celebrating its inaugural semester in 1978 it was almost instantly pending closure. In an effort to save money, the School Board voted 5-2 to close WAMO in 1981. This decision was met with strong student protest and disappointment as over 200 students marched to the Portland Public School District office to voice their opinions. Although their feelings for the school were strong, their efforts were lost and Washington-Monroe was officially closed in May 1981. After Washington High School closed in 1981, it reopened two years later as the Children’s Services Center—a multipurpose social service facility that provided day care and programs for at-risk youth. However, its doors were closed again in the 1990s and the building stood vacant for almost two decades except for the annual summer Time-Based Arts Festival. The neighborhood had great hopes that one day the building would be repurposed as multi-family housing. Many developers considered the property for redevelopment, but for a variety of reasons could not bring forth a viable project. 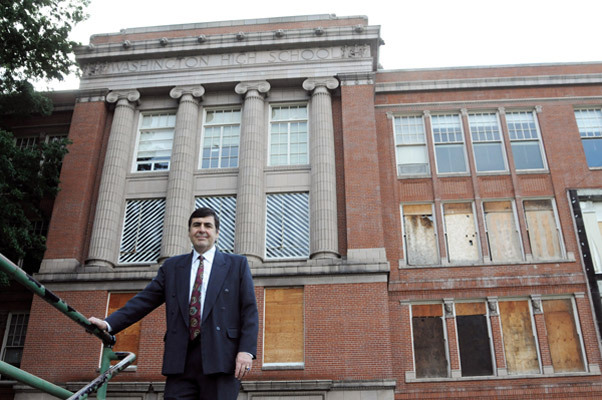 The late preservationist and developer, Art DeMuro, in front of Washington High School. In 2009, Art DeMuro—local developer and Landmarks Commissioner—began working with the neighborhood and School District, championing the reuse and preservation of the old high school. In 2011, his firm—Venerable Group, Inc.—was selected through a competitive process to acquire and redevelop the school. However, Art suddenly passed away in 2012, putting the project in jeopardy. In 2013, Venerable’s new president, Craig Kelly, established a partnership with Pacific Realty Associates “PacTrust” and the two firms paved the way to finally acquiring the property and commencing work to renovate the 116,000 sf structure. Reuse as commercial office and event space was determined to be the best fit for the building. As part of this process Washington High School was formally designated as a historic landmark. The scope of improvements included all new electrical, plumbing, and mechanical equipment; an acoustically-engineered and state-of-the-art auditorium; roof deck with sweeping views of downtown; new energy-efficient replica wood windows on the south façade and restored windows everywhere else; new elevators; full ADA accessibility; and new restrooms. In addition to these modern features, the brick and terracotta façades were cleaned and restored; classroom features such as the slate chalkboards, teacher’s cabinets, and IBM clocks were preserved; and, in general, as much of the school character and history was kept to tell the story of this important building. 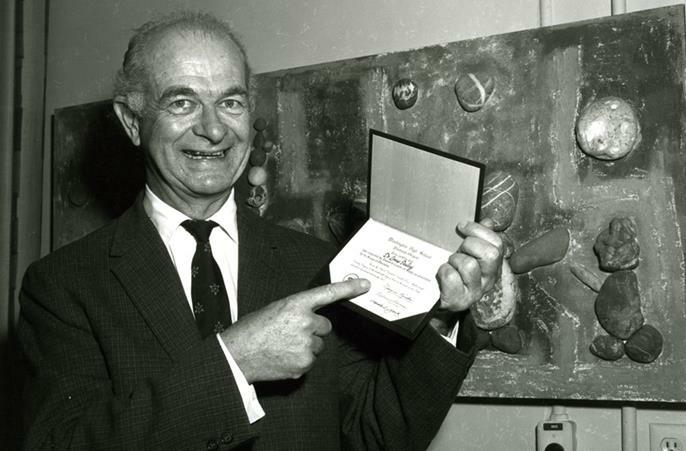 Linus Pauling with WHS diploma in 1962. Although Linus Pauling received honorary doctorates from some of the most prestigious universities in the world, it was not until 1962 that he received his twentieth degree—a high school diploma—from Washington High School. The 45-year gap between senior year and his receiving the diploma was due to a regulation that prevented Pauling from taking two courses in American history during the same term, ultimately, preventing him from graduating in June 1917. However, at the time, Oregon State University accepted students who had not graduated from high school, so Pauling left for Corvallis and, eventually, a long life in academia. Other famous alumni of Washington High School include chef James Beard, former Governor Victor Atiyeh, and Portland businessman and civic leader Bill Naito.